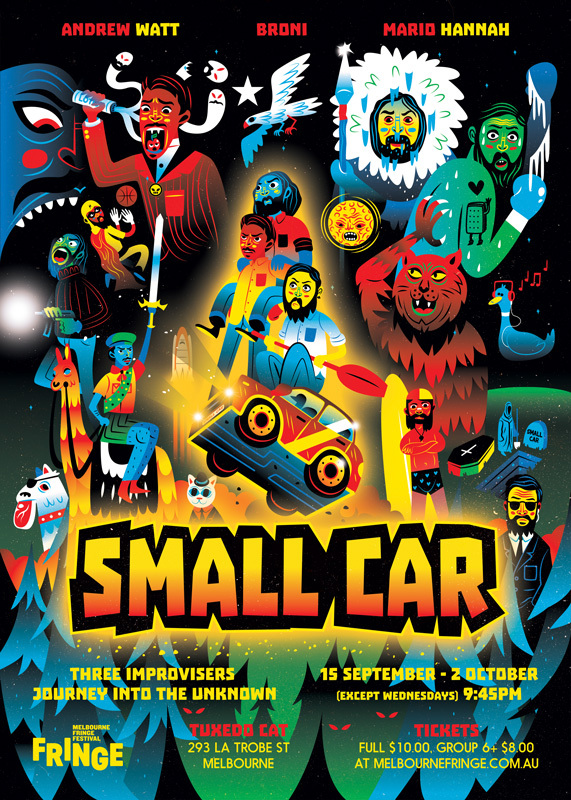 The three funny fellows from Small Car Comedy (Melbourne) approached me to design the poster artwork for their next stint in the Melbourne Fringe Festival (and later the Melbourne International Comedy Festival). As improvisers, their shows involve a whole array of bizarre characters and other weird things, so I was not at a loss for what to draw! The brief was to incorporate as many of these crazy elements as I could into a poster, influenced by the sort of artwork made mainly for over-the-top action films. "I only had a rough idea for a poster concept but when I spoke to Adrian I knew I'd found the right illustrator for the job. He took the time to understand my concept and came back to me with a whole range of brilliant visuals that were much better than anything I could have come up with. I couldn't be happier with the final product - it perfectly translated all my ridiculous ideas into something that looks incredible." Taking the list of characters and scenarios I was given, and incorporating some of my own ideas, I provided multiple illustrated concepts to the client to choose from. Through a process of identifying a favourite composition, and which visual elements were most important to emphasise, a combination of two posters was the victor. 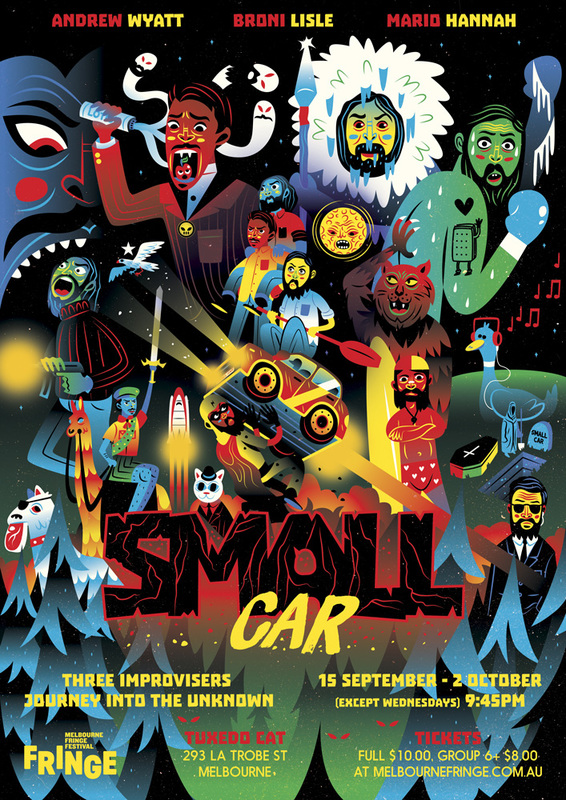 Despite the call for a somewhat chaotic image, the most important asset, the comedians on the car, were feeling a little lost among the other cast of characters. To resolve this in the final illustration I made them larger by shifting around the other elements and surrounding them in a heavenly glow that simultaneously highlighted the crew and brought them into the foreground. This is the original title type I designed which had a crumbling rock quality and a black interior. While I think it looks pretty awesome on its own, in the context of the poster it felt largely lost. The guys wanted something very clear, so we decided to retain a similar typeface but make it much more bright and legible, and it was ultimately a successful solution for the final product!